← Catch Skull & HaHa in Singapore this coming July! We just bid goodbye to Music Matters. Fret not, music lovers. Another music festival is here. 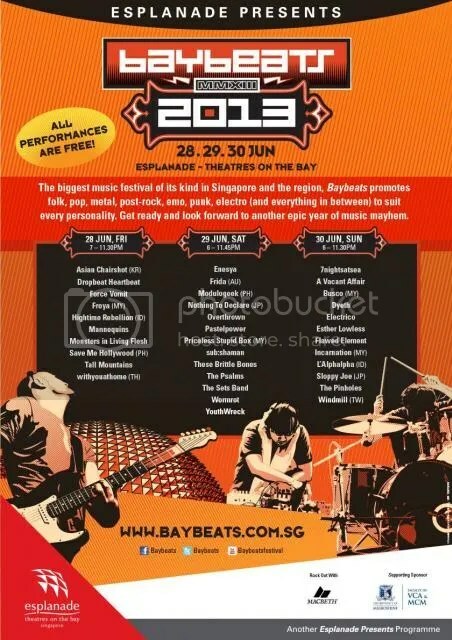 Happening at the end of this month, from 28 to 30 June, Baybeats features local acts as well as acts from around Asia. This three days festival aims to promote folk, pop, metal, post-rock, emo, punk, electro (and everything in between) to suit every personality. Happening at around the Esplanade Theaters on the Bay, music lovers are spoilt for choices on which act to catch during the festival. Oh my, this reminds me of Music Matters. I’m really excited for Baybeats. I really hope i’ll be able to watch These Brittle Bones perform this time round since I did not manage to see him during Music Matters. Do you have any favourites that you think I should watch or interview them? Share it with me! For more information on the festival, check out their website and follow them on Twitter!